for the Italian market. Distilled at Glenmore Distillery. Everyone agrees that change must be coming to Craft whiskey, but what form will it take? Craft whiskey in the USA is full of effusive creativity: wild mash bills, whiskey sold underaged (or just white), and localvore flavor variations. Infused and flavored whiskeys are on the table, and so is volatility and the potential for change. Whiskey geeks love to discuss what's going to happen to Craft. "The good ones will succeed, maybe with some mature stuff eventually, while the crappy ones will go belly up" ... is how a lot of these discussions go. But the recent lesson of top Craft distillery Balcones - with the creative force and brand creator Chip Tate unseated from the company and a group of investors proceeding to develop Balcones' distillery as a larger scale more corporate entity while Chip goes off to start a new distillery suggests a different path of evolution for Craft whiskey; one pretty familiar in the Craft Beer arena: corporatization. Is this really happening? Well, another example of the movement from Craft to corporate in American whiskey is the interesting case of Limestone Branch which is turning 180 degrees from white dog Craft to classic Bourbon via a merger - news of which broke on December 2nd 2014 via Chuck Cowdery's Blog that liquor brand producer/marketer Luxco was buying a 50% stake in the small Lebanon, Kentucky craft distiller. Luxco is a company that has bought brands and then bottles bulk sourced liquors labeled with those brand names. Their best known products include straight alcohol brand Everclear and, in the whiskey end of things, Rebel Yell (once the light bodied wheated mash bill Southern market exclusive specialty product of Stitzel-Weller), and Ezra Brooks. They also have the venerable brand "Yellowstone" which once was one of the bigger selling Bourbons in the pre-glut era; one with a very long history that stretches well back into the 19th century. Yellowstone is still sold now with juice Luxco sources bulk - at a low price and quality level. 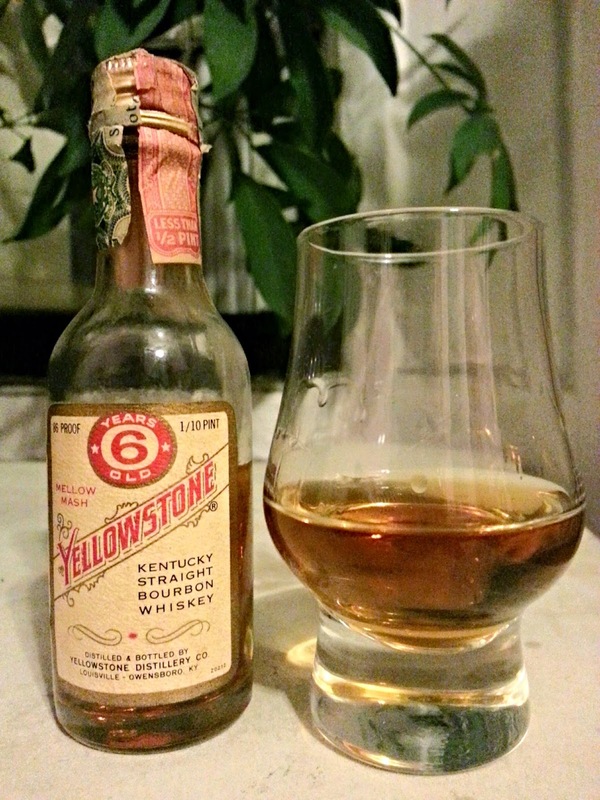 But from 1935-1991, though, Yellowstone was made at the Glenmore Distillery (where Kentucky Tavern was made too) and had a sterling reputation. Glenmore stopped distilling in 1993 (but still operates as a bottler and a rickhouse). Partnering with Limestone branch is a big step for Luxco. It marks their entry into Bourbon distilling. It's also presages an ambition rebranding effort. Luxco is going to try to have resurrect a fallen brand back into something special. The partnership marks a big change for Limestone Branch too. They have been making variations on sugarjack and this marks their entry into Bourbon distilling too. After Prohibition, Yellowstone moved to a new location in Shively, south of Louisville. It was solely under the Dant family's control but Beam family members were employed there as distillers. In 1944, the brand and distillery were sold to Glenmore. It was a massive facility that made bourbon until 1991. In 1993, after Glenmore was sold to what became Diageo, Yellowstone was sold to Luxco where it became an unpalatable bottom-shelf brand made by one or more unnamed Kentucky distilleries. A column still, additional pot still, automated bottling line, and barrel house will be added at Limestone Branch, which plans to begin distilling the original recipe for Yellowstone (their uncle had a copy) in early 2015. Cowdery has provided more of the back story of Yellowstone in previous posts on his blog back in 2009, by the way. It's a story that goes back to the roots of the industrial revolution in Bourbon distilling in the 19th century and includes some of the biggest names in Bourbon. Period. "The Yellowstone whiskey brand was created by the wholesale firm of Taylor & Williams shortly after the national park was established in 1872. Taylor was D. H. Taylor, who started the firm in Louisville about 1865. J. T. Williams joined the company in 1877. They were wholesalers and bought whiskey from various distilleries. Sometime in the 1880s they contracted with J. B. Dant to make Yellowstone bourbon for them. 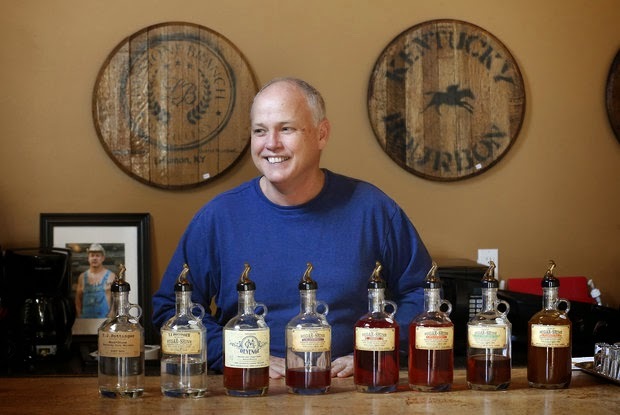 Dant had a (then) new distillery in Nelson County, Kentucky, at Gethsemane Station. It was called Cold Springs Distillery. 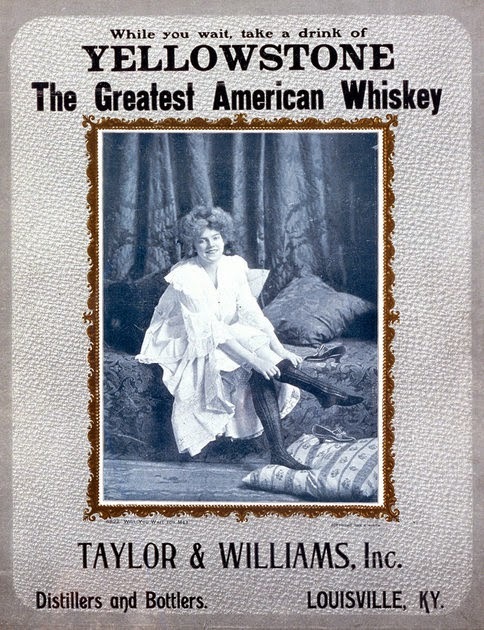 In about 1903, Taylor & Williams merged with the Cold Springs Distillery. Dant became president and the distillery was renamed Yellowstone, as that brand had become very successful." "After prohibition, J. B. Dant and his sons built a new distillery in the Louisville suburb of Shively to make the revived Yellowstone bourbon. Various Beams and Dants were involved in that operation too. Another Louisville-based whiskey maker, Glenmore, bought Yellowstone, brand and distillery, in 1944. 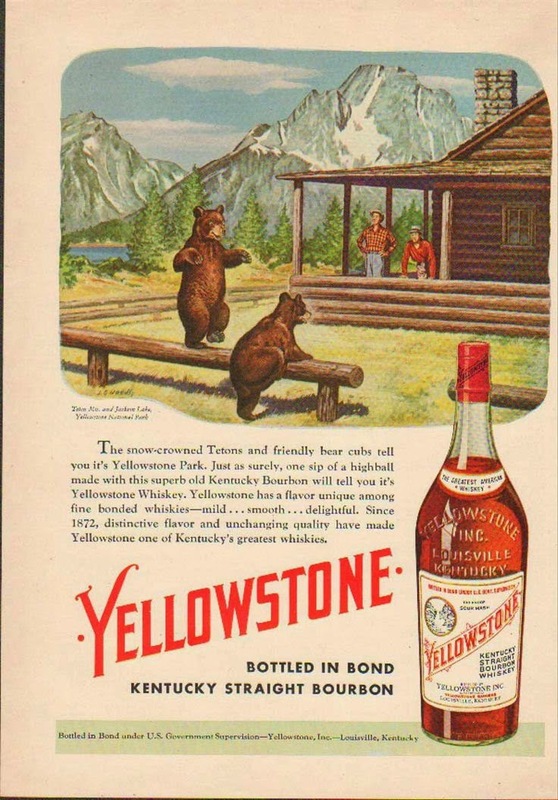 Yellowstone was a significant brand in its heyday, but as a mass or popular price brand, it suffered brutal share losses during bourbon’s sharp decline in the 1970s." Dants and Beams made Yellowstone both before and after Prohibition. You don't get more blue blood in Bourbon history than the names "Dant" and "Beam". And Yellowstone was a leading and classic distillery and brand. (Tasting notes below). That name "Beam" is the thread that binds this history to Limestone Branch. This is a tasty liqueur. Tastes exactly like a baked apple pie that has been allowed to cool. Even the mouthfeel is correct since the liquid in an apple pie gets nicely thick and syrupy. The focus on moonshine and sugar jack (i.e. white rum) at Limestone Branch a nod to the illicit local hill traditions and a play at the new trends in flavored whiskies. It's classic "Craft whiskey" in the new distillery vein which is all about youth and added flavors and playful mash bills. Here it's moonshine white dog with an interesting mash bill (here it's half moonshine sugarjack, and half white corn whiskey). As you pull into the parking lot, the first thing you see on the side of the building is a large Moon Pie sign. One of the products they produce is a Moon Pie flavored moonshine that, my wife tells me, is scarily close to the real thing in flavor. 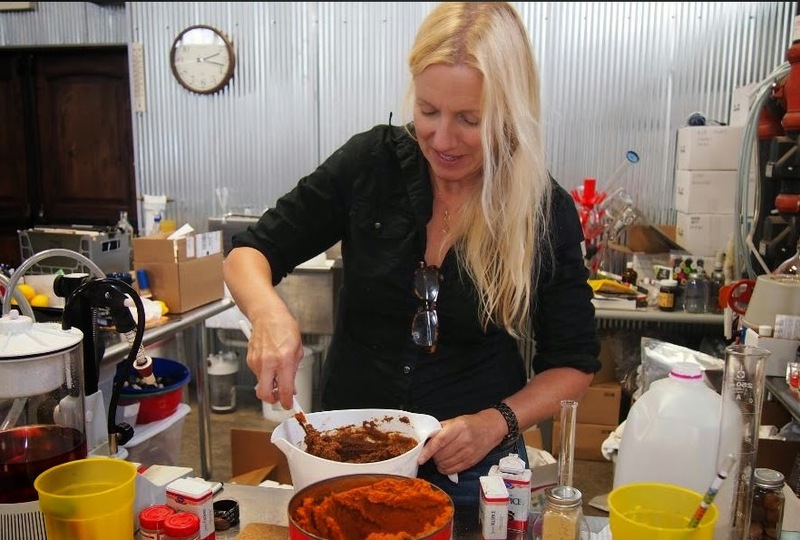 here mixes up the Pumpkin Pie Shine flavors. "I'm pulling for them as well, this is the kind of partnership I can support. A new whisky based on the original Yellowstone recipe won't be the same of course but it is a great idea." So, granted that Limestone Branch's recreation will be a new thing. What did the old thing taste like? Yellowstone 6 43% abv. 1970s dusty Italian market export. Nose: Sandalwood oak, vanilla, salted caramel, butter, light solvent, and jelly candies. Palate: Candy up front - sugar dusted fruity flavored hard candy and more of those jelly candies. Then, on the expansion, toffee, sweet cream, citrus, and lightly tanned leather. At the turn, leather and char take over with some nice tannin spice and a ton of vanilla on the finish. Nice vividness and intensity of flavor. Floral and sweet. But the finish is only medium long. Also, not a huge body. But it's a very pleasing set of flavors. I'd like to try this in a higher proof expression, but I can understand why this was a popular leading Bourbon. It's very tasty and accessible. It's also a classic Bourbon flavor profile you don't see any more: fruity candy. It's something special that's gone. Limestone Branch is going to have to take a hard turn from its effusive shines back to tradition to get this right. I'll be watching with interest. Is this a bellwether event in the evolution of Craft? Time will tell. Moonpie flavored moonshine is classic craft whiskey. I read it here first. And you're right. I actually follow the Twitter account, @drinkmopie, but somehow hadn't thought of it as either classic or craft. I also agree that it will drive purists apoplectic, in which case a deep breath is in order. Unaged, flavored spirits in little brown jug and mason jar style bottles aren't stealing much thunder or reputation from Balcones and other small distilleries making good to excellent whiskey in the legal, 100% grain, no flavorings added sense. On another note, I always wonder what those original recipes look like. Has anyone seen a copy of what a distillery claims is an original recipe, and if so how detailed is it? Hi Tom! I get your sarcasm about me calling Moonpie flavored moonshine "classic Craft whiskey" - but I'm not saying "classic Craft" to refer to "the best of Craft", but rather as the "the most common state of Craft whiskey" - at the moment. Young - often white - whiskey, often with a creative mash bill, and often bearing some extra flavor, is a hallmark of many many craft distillers - including top names like Balcones and Corsair Artisan. It's also a hallmark of the hundreds of less well known Craft distillers struggling to make a go of it, trading on the localvore market. Many of them are going to have to evolve or die. The real story here might be the Beam name and family connection providing an avenue for Limestone Branch to become something very different from what it is now - a hybrid of a Craft and a larger corporate distllery. As for your question about the recipie, I'm going to pursue that angle for a follow-up. Thanks for the great question. BTW - I love your latest post on Weekend Whiskey/. If Luxco/Limestone Branch bottles this resurrected Yellowstone at 86 that would be a disappointment. I think all of this experimenting with flavors is interesting but essentially a no go (at least for me). I have zero interest in moon pie or pumpkin or quinoa or honey or cinnamon or apple pie flavored bourbons. To me: it's all gross. I don't want anything added to the bourbon but water - that's it. However, I completely applaud all of these craft folks. My greatest concern is that they all - almost universally - price themselves outside of the market. How can the consumer make a BUY decision on a 1 year old bourbon, for example, priced at 40 for a 750ml bottle when that same consumer can get acknowledged winners for the same price and for much less? I see almost all of the craft distillers trying to place themselves as "boutique" producers and thus make themselves inaccessible to their core market of bourbon people. I find this is a serious miscalculation. I fully understand that they have operating costs, expenses, etc blah blah blah; but if they do not sell their bourbon and lots of it, how will they survive? They won't. All of this is entirely counter-intuitive to me. I want to support these small distillers but they make is almost impossible to do so because of their high prices. I would like to see some of these folks really be aggressive with their pricing so that they can build an audience of loyal consumers. That's how they will survive. Family lore says my wife's grandfather, A.E. Mitchell, redesigned the Yellowstone name in the early 20th century while working for a firm in Los Angeles. But his wife wondered whether he could continue doing work for liquor companies because of the family's deeply held religious convictions. She asked, "Do you think you can honor God with this kind of work?" He quit accepting liquor assignments. About that same time he redesigned the Del Monte brand. Later he was a Bible teacher for Aimee Semple McPherson and designed Scripture plaques (seen on Ebay) and developed the missionary agency, Go Ye Fellowship. .
Hi! 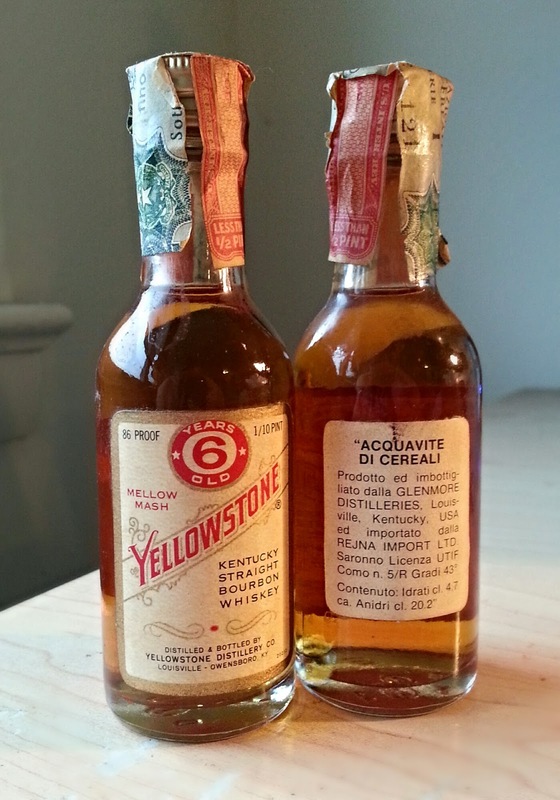 i just bought a vintage bottle of Yellowstone something-or-other from an estate sale. it is a golden color, it has never been opened as the bottle has both an unpierced cork and over that is a metal lid. any ideas what it could be? do you think it is ok or even better with time (the dusty bottle looks decades old to me!) please let me know at JaneDoe@gmail.com thanks!